Jimmy Gopperth's late penalty gave Wasps their third straight Premiership victory as they edged out Newcastle. In a first half of few try-scoring chances, Gopperth and Wasps old boy Andy Goode exchanged kicks in tough conditions to make it 3-3 at the break. Nili Latu then crossed from close range for an unconverted Newcastle try. But, after two disallowed Wasps tries from Christian Wade and James Cannon, two Gopperth penalties against his old side earned victory for the hosts. Falcons were left to rue rue missed opportunities in the windy conditions at the Ricoh Arena. Goode, making his first start for Dean Richards' side against one of his five former clubs, missed two penalties, while his conversion attempt hit the post. Right at the death, Newcastle had Goode in the pocket waiting for a drop-kick attempt, but Giovanbattista Venditti - who was sin-binned midway through the second half - knocked on as the ball came loose and Wasps saw the ball dead to earn victory. The hosts had Wade returning to the back line after a three-month injury lay off and, midway through the second half, he had the ball down in the corner, but was ruled offside from the kick forward by the TV match official. Cannon - an early replacement for injured lock James Gaskell - also thought he had scored for Dai Young's side, but the referee adjudged that there was a forward pass in the build-up. Newcastle remain second bottom in the table, four points above London Irish, while Wasps move above Gloucester into fifth. 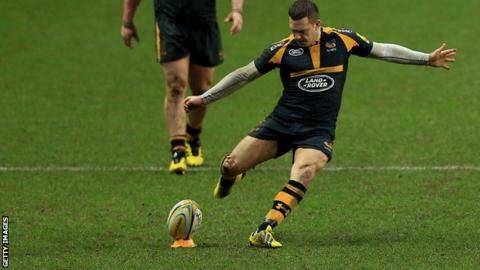 Wasps' victory was the first time in four years that they had won a Premiership game without scoring a try. "It was a typical Wasps effort. We seem to have to win games three times over, then try and find four ways of throwing it away. "We squandered a couple of opportunities. The conditions made it a very tight game but they don't suit us as we want to play with tempo. "We have to be smarter than that, especially in the last few minutes. We were lucky to come out on the right side." "We are hugely disappointed as we were controlling the nothingness and Wasps were getting frustrated in that second half. "We need to be more clinical but will learn from it. "Getting a point out of the game was a positive, as Wasps are one of the form teams of the Premiership." Wasps: Miller; Wade, Macken, Downey, Bassett; Gopperth (capt), Robson; McIntyre, Shervington, Cooper-Woolley, Gaskell, Myall, Rieder, Young, Hughes. Not Used: Swainston, Stevenson, Jackson. Newcastle: Hammersley; Tait, Powell, Socino, Venditti; Goode, Young; Vickers, Lawson, Vea, Wilson, Robinson, Welch (capt), Latu, Hogg. Replacements: McGuigan, Rogers, Ryan, Botha, Mayhew, Takulua, Willis, Watson.